I’ve always been wary of blogging about blogging because most of my blog audience isn’t interested in the topic. But personally I love reading and talking about blogging, so I’ve decided to start a blog series that I’ll be keeping separate from my regular content. You won’t see these posts featured on my home page or shared on my blog’s Facebook page, but instead you can find them under “Blogging” in my navigation menu, on Bloglovin’, or you can subscribe to my separate blogging newsletter for updates. In my 2016 recap post I casually (lol, not really casually at all) mentioned that starting January 2017 I will be blogging full-time. And suddenly my inbox was flooded with one repeated question: does this mean I’ll be leaving Norway? 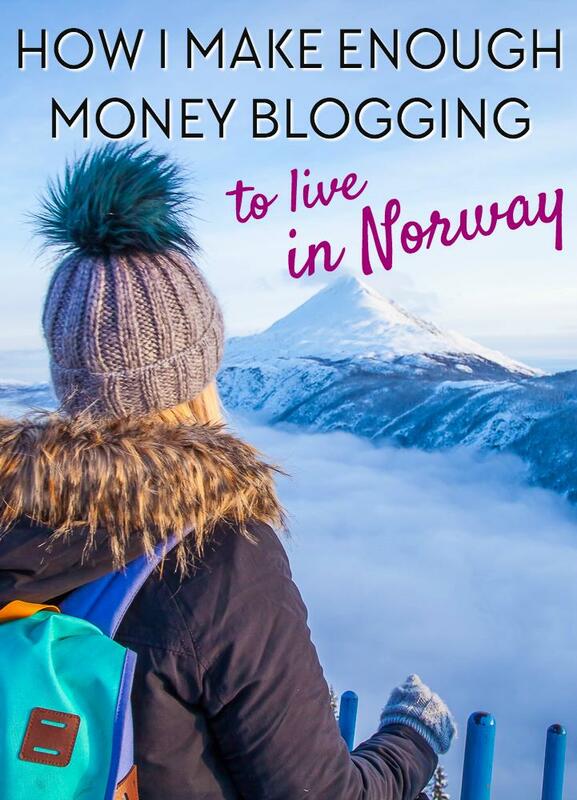 I adore blogging, but I adore my life here in Norway more, and if I weren’t able to make enough money blogging then I would definitely pick up a part-time job here to supplement my income – in fact that’s what I was doing all of last year. But around last autumn I realized that I was beginning to make enough blogging to support myself here. Norway is of course not the cheapest country in the world to live in, and I think part of me always felt like if I wanted to work online I’d have to move to Eastern Europe or Southeast Asia, but eventually I realized that earning a Norwegian income through my blog wasn’t such an unattainable goal after all – it simply would require treating my blog less like a hobby and more like a business. I’ve been blogging for just about 3 years (I registered Heart My Backpack on January 17, 2014!) and it wasn’t until this past year that I began to earn any real money from it. While the Internet is full of these “How I Earn Money Travel Blogging” posts, somehow I still feel like the whole business is shrouded in mystery. 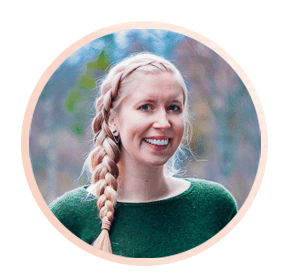 Like, it took me ages to figure out how much to charge for sponsored posts, how to set up passive income streams that earned more than a few cents a month, and in general how to monetize my blog without killing its soul. So, while this post is just an overview and each of these topics could be its own blog post (and maybe they will be! ), I’m going to try to be as detailed as possible here to give you a bit of an idea of how I’m making enough money now to like, not starve. And for reference, because with most of the income streams mentioned here it does matter, right now (September 2018) my blog is getting about 300,000 page views a month and I have around 200,000 followers on social media. So, I know a lot of bloggers really hate display ads, but I’m actually a fan of them! All the news sites I read use them, so as a reader I’m already incredibly used to them, and since I don’t like to take on more than one or two sponsored posts a month, display ads are a good way to monetize my other blog posts. I first started with Google Adsense, which only earns money when someone clicks on an ad, and then later I set up ad waterfalls with a few different ad networks like Sovrn, LiveBurst, and Google Adsense, but now I use Mediavine for all my ads. On average, with Mediavine I make around $20 for every 1,000 sessions (revenue per thousand impressions, or RPM). The amount largely depends on the time of year, as companies pay the most for ads in Quarter 4 and the least in Quarter 1 (so January is the lowest earning month). Your RPM with Mediavine also will be different depending on where your readers are coming from – generally the higher percentage are in the US, the more money you’ll make, because Mediavine is based in the US and most of their advertisers are American. So I have friends who make more like $30 per 1,000 sessions, while I know others who make closer to $15. You do have to have 30,000 monthly page views to join Mediavine, which seems to be a good threshold anyway for putting up ads on your blog because below that you probably won’t be earning enough money to make them worthwhile. Edit: A lot of people have emailed me asking for my personal review of Mediavine, and yes, I would 100% recommend joining their network if you meet the page view requirement (and if you don’t, I’ve written more about growing blog traffic here). Update: It’s funny, because when I first wrote about using Mediavine no other travel bloggers were using them, and in fact most travel bloggers were really vocal about never having ads on their blogs. They saw them as selling out, which always seemed so weird to me, because those same bloggers who refused to have ads on their blogs would constantly go on sponsored trips and write sponsored posts for brands. And as a reader, I personally would way rather read a post where the content is totally independent without any sponsorship, even if that means having to see an ad every few paragraphs. A lot has changed with travel blog income since then, and now I think most full time travel bloggers make a portion of their income from display ads. And that’s a good thing! And yet at the same time, I sometimes really regret ever writing about Mediavine in this blog post. The day after I hit publish, my inbox was flooded with emails from bloggers wanting to know more about Mediavine, and within a few months most of the top travel bloggers were using Mediavine. And I don’t know, I guess I wanted credit? Like now whenever people talk about Mediavine I want to shout I was the one who introduced you guys to it! The same people who had been so adamantly against display ads were now going on about their great Mediavine income, and suddenly I got it. I got why so many bloggers are so secretive about the ways they make money. I’m really embarrassed to admit I sometimes wish I hadn’t told anybody about it. Because deep down I do wish people were more open with the ways in which they make money. And ultimately, so many travel bloggers joining Mediavine was a good thing for me too, because it made the network bigger so that it could raise its rates, which means more money for all of us. I guess what I’m saying is, I totally get the instinct to be secretive about how you find success, but I do strongly believe that if we would all be more open it would be better for all of us. Okay sorry, rant over, haha. Affiliate marketing is a favorite amongst bloggers and for good reason – by signing up to affiliate networks you can link to products you already use and love and make a small commission (at no added cost to your readers) when someone makes a booking or purchase through your links. I almost feel like I shouldn’t be writing about affiliate marketing, because to be honest I’m really lazy with it and kind of almost cheat. I have Skimlinks installed on my blog, which automatically changes any link to one of their merchant sites into an affiliate link. Their merchants include Amazon, Booking.com (lol see what they did there? ), TripAdvisor, and a whole lot of other companies I don’t even know about. Just last week I made commission from a Sephora sale (I think from a moisturizer I once mentioned) and I hadn’t even realized they were a Skimlinks merchant. My biggest earner through affiliate sales is hotel bookings, and I usually make several hundred dollars a month from the hostel and hotel recommendations in my travel posts. It’s really easy income, and something I should probably be more proactive about. UPDATE: Affiliates now make up the largest part of my income, and you can read more about how and why here (under the heading “Most of my income is passive“). I also love making money from affiliates because it means that my blog is doing what it’s meant to be doing – it’s helping people plan and book their travels. Sometimes when I work with destinations or brands I’ll have moments of doubting myself and feeling guilty for charging as much as I do. But then I remember how much money in hotel bookings, car rentals, flights, clothing, etc. that my blog drives each month and I feel confident again. In other words, affiliate marketing isn’t just a good way to earn extra income, but it’s also helpful in measuring your blog’s influence. I track which hotels are driving the most bookings, and which destination posts make the most money, and then I can see which posts and topics on my blog are doing the best, and what I should do more of. Skimlinks is especially helpful for this because in their reports you can see not only which links drive the most sales, but also how much money each article on your blog makes. So helpful! Sponsored posts can be my biggest earner in a month, but I’m also incredibly picky with them so often I won’t do any. Basically, there are two kinds of sponsored posts: SEO posts, where the brand sponsoring you doesn’t care if anyone reads the post as they just want your website to link to theirs, and then there are advertorial type posts where the brand wants to reach your audience. The first type of post won’t earn you very much and can lead to getting penalized by Google (since you’re not supposed to sell links). Personally I don’t think they’re worth it as they don’t pay well and come with a risk, but I know some bloggers who make lots of money from them, so to each their own! If you do choose to do them though, use a plugin like Ultimate Category Excluder to hide them from your readers (the brand won’t mind as they’re only after a follow-link). I think now these posts tend to make between $100 and $200, depending on if you’re writing the content or the brand is providing a guest post, and based on how high your DA is (you can check your DA here). You’ll probably start getting inundated with SEO sponsored post requests once your blog reaches a DA of 30. The other type of sponsored post is much better paying, and the brand will let you use a no-follow link, which means Google won’t consider this selling links (so no risk of being penalized). Figuring out what to charge for these sponsored posts is a constant struggle! The best guide I’ve heard is to charge $1 for every view to that post that you can guarantee in the first month. So when I check my blog posts from last month, some did surprisingly well, but a few of the more mundane (maybe slightly boring?) posts only had around 2,000 – 3,000 views, so my rate for a sponsored post would be $2,000 – $3,000. And that’s about how much I’ve been able to get from brands for sponsored posts (that’s usually including one Facebook share and one Tweet – any extra social shares will cost more). You can see an example of one of my sponsored blog posts here. You can also check Social Bluebook for ballpark figures for how much to charge for sponsored blog and social media posts. I think the first time I checked Social Bluebook I thought their estimates were way too high, but in fact I had just been way undervaluing my work. A lot of my sponsored posts have come from brands approaching me (usually travel sites like Expedia or TripAdvisor), but I’ve also gotten several posts through sponsorship sites like Inzpire, Cooperatize and Izea. I should add though, I’ve seen a lot of changes in sponsored posts over the past few years, so I would be wary of relying too heavily on them for your income. I always say that it’s best to focus on income streams you control yourself, which is why I focus mostly on driving traffic for display ad income and driving bookings for affiliate income. Working with brands and destinations is just a nice extra. Oftentimes brands will only be interested in social media posts. While I don’t often do these as they tend to be super random, I do always offer brands a package of added social media coverage on top of sponsored posts, which is a nice way of getting more from a collaboration (or if they say my rate is too high I offer more social media coverage instead of reducing my rate). There are a lot of social influencer sites out there connecting brands with bloggers, like Clever Girls, TapInfluence, BlogHer, and Social Fabric, though personally I tend to just work with brands directly. I’m also very protective of my Facebook and Instagram pages and don’t like to put much sponsored content on them. My best earner from social media posts is through Instagram takeovers (where I post my photos on a brand’s account), which I charge $500/day for, and sponsored Instagram posts on my own Instagram profile, where I charge $700 per post. Oh hey, remember that time I made a Pinterest e-course? Actually, you probably don’t, as I gave it pretty much zero promotion. I was a private tutor and then teacher for something like ten years (that makes me sound really old – I’m 28!) and I secretly totally miss teaching. So last winter I made a Pinterest for Travel Bloggers e-course. But I always felt weird about promoting it since, while the traffic I get from Pinterest each day (around 1,000 – 2,000 hits) is a lot for me, I know it would be considered almost nothing to some bloggers. But even with the total lack of promotion a couple of people usually sign up for the course each month, which means a bit of added income for me, and I get to feel like a teacher again – yay! I wasn’t going to include this one at all since I rarely say yes to press trips, but I do have a couple lined up this year. Usually with these sorts of trips I will either reach out to a destination with an itinerary I’ve already planned myself, in which case they will generally cover my accommodation and transportation costs for the trip. However when a destination reaches out to me with an itinerary they’ve planned then I will charge a day rate for the trip, as this is a campaign they’ve designed for their own marketing purposes. Next week I’m leaving for Finland for two weeks to participate in NBE Finland and the #HelsinkiSecret Residence, and they’re paying me to take some photos and do an Instagram takeover. And I have a trip planned for later in the year where a destination will be paying me $1,600/day for social media + blog coverage and a couple of YouTube videos. I don’t like working with destinations I don’t already know and love, so when I do work with a place I try to do a really good job so that I can work with them again and again. I do very little freelance writing these days (in fact I tend to only say yes to requests because I’m really bad at saying no! ), but it can be a nice safety net for bloggers, since our blogs essentially act as writing portfolios. Personally I would never write an article for less than $500, as otherwise I figure that time could be better spent approaching brands for collaborations or updating my affiliate links. Beyond these income streams, there are of course loads of other ways for bloggers to make money. Some take on work as a VA, sell photos, monetize YouTube videos, act as brand ambassadors, run tours, offer blog consultations, write ebooks – and I’m sure lots of other stuff that I’m not creative enough to think of right now. I will say, however, that I’m really glad that I waited as long as I did to monetize my blog. I know it’s different for different people, but personally blogging is a whole lot more to me than a source money, and I would much rather earn nothing at all from it than risk losing my love for it. I hope that I can continue to enjoy blogging while earning an income from it, as there’s no job I’d rather be doing, but if that changes then I won’t hesitate to return to hobby blogging. That’s so nice to hear! They’re so wonderful. I love reading posts like this! It inspires me to invest more on my own blog and to attempt to make it my full-time income as well. Thanks so much for the helpful info! Hi, I just discovered your blog when I searched on Google “Casablanca and blue city”, read your blog post about that and then from click to click arrived here. I just want to thank you for this blog post, I am a new blogger and I needed tot read this! Thanks for taking the time to reply to my email! Really appreciate it. Cheers for the tips too! Ahhh… you learned so quickly! I’m still getting the hang of things even after blogging for a while 😀 Love the tips and it’s so cool affiliates have finally become your #1 – that’s my favorite form of income! Agreed, affiliate income is the best! Wow, thank you for the transparent information. The way you write about blogging and making money out of blogging is really refreshing. I launched my site as it is now in early 2017 – but I have to admit I was a bit lazy in creating content. I used to think that good content and good visuals will push the blog, but that’s just a tiny part of success. In my attempts to push it, I tend to get overwhelmed and depressed when I read about all the growth possibilities the blog offers, and honestly, I don’t know where to start from. All the best for you and yor blog!